Traditional knowledge is maintained, transmitted and renewed through the use of diverse biological resources, both wild and domesticated. It is embodied in traditional varieties domesticated and improved by indigenous communities. In the indigenous worldview, intangible traditional knowledge is inextricably linked to the more tangible ‘biodiversity’ it draws on — and cannot be separated from it. Traditional knowledge and innovations are driven and sustained by cultural values, spiritual beliefs and customary laws, which are in turn sustained by ancestral landscapes and the sacred sites they contain. There is also a direct link between traditional knowledge and landscapes. For example, Quechua people believe that the mountain gods teach knowledge. Research also shows that traditional knowledge is lost when the link to ancestral lands is broken. 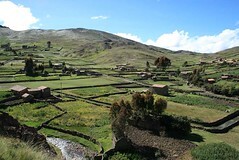 When traditional varieties are lost, associated TK is also lost; and when they are restored so too are the associated knowledge, practices and cultural values (as evident in the Peru and China cases). Hence cultural information is embedded in seeds. For more information see: Protecting community rights over traditional knowledge: Implications of customary laws and practices. Key findings and recommendations (2005-2009).